Moons of this planet are named for Greek or Roman mythological characters with links to Neptune, Poseidon, or the ocean, according to International Astronomical Union guidelines. The irregular satellites are named after the daughters of Nereus and Doris, who were attendants of Neptune. The latest moon discovery was announced in 2013. Scientists spotted the satellite — temporarily called called S/2004 N 1 — after analyzing old images from the Hubble Space Telescope. The moon is tiny, said to be about 100 million times fainter than what the naked eye can spot in the night sky. Due to Neptune's distance from Earth, only two moons were confirmed with ground telescopes before Voyager 2. The first one, Triton, was actually discovered only 17 days after the planet itself was found. Triton is the only large moon in the solar system with a retrograde orbit, circling in the opposite direction of Neptune's rotation. Found by British astronomer William Lassell in 1846, it remained a small dot in a telescope for well over a century until the Voyager 2 spacecraft flew through Neptune's system in 1989. The moon, which is 1,680 miles (2,700 kilometers) in diameter, has few craters on it. The surface consists of "smooth volcanic plains, mounds and round pits formed by icy lava flows," according to NASA. Scientists believe Triton has a frozen nitrogen crust overlaying a rocky, metal core and ice-filled mantle. It also has a nitrogen atmosphere — likely created from volcanic activity — with methane traces. Voyager 2 also saw geysers, making Triton one of only a few moons known to be geologically active. Ahead of the New Horizons flyby of Pluto in 2015, NASA released the best-ever map of Triton because the two worlds were expected to be somewhat similar; this would allow for comparisons. Nereid is the other confirmed telescopic discovery, but it is much smaller: 105 miles (170 kilometers). It was discovered in 1949 by Dutch-American astronomer Gerard Kuiper, but was so small that Voyager 2 only managed to capture a distant, blurry image as it flew by. Scientists believe Nereid is a captured asteroid or Kuiper Belt Object because its orbit is eccentric, NASA stated. It is distant from Neptune, in an orbit that takes 360 Earth days to complete. Voyager 2 flew through Neptune's system in August 1989, and found several satellites during its journey. Astronomers did technically spot Larissa, a 60-mile (97-kilometer) moon, in 1981 with a ground telescope. But it wasn't confirmed until 1989, when the spacecraft was close by. Voyager 2's images showed an asteroid-like body with a surface pockmarked with craters. The moon's orbit is slowly moving closer to Neptune. Scientists believe it will either smack into the planet's atmosphere, or break into a ring if tidal forces first rip the moon apart. Proteus was a surprise find because it was so large: 130 miles (210 kilometers), bigger than the moon Nereid that was first spotted from Earth. Proteus, however, is much darker and could have eluded telescopic detection for that reason. The moon has a lumpy shape with many craters. If it was just a bit bigger, its gravity would pull the moon's shape closer to a sphere, NASA said. Tiny Naiad – which looks a bit like a potato in shape – probably is a combination of fragments from several Neptune satellites, NASA said. The moon wasn't found by astronomers again until 2013, when scientists used a different technique on Hubble Space Telescope images to reduce Neptune's glare – making the moon pop out. Thalassa probably has a similar composition to Naiad, but the planet is disc-shaped despite its small size. 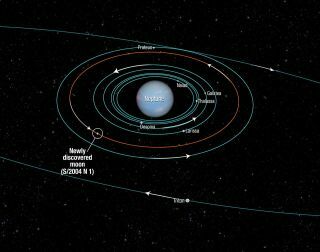 Both moons also have orbits that will eventually fall into Neptune. The spacecraft also found Galatea – which may have gravitational effects on Neptune's rings – and Despina, which is within the rings themselves. While there is no spacecraft en route to Neptune, telescope technology on the ground is improving with the aid of tools such as adaptive optics. There also are telescopes in space that don't have to fight through the Earth's atmosphere to see things. Both of these changes allowed many Neptune moon discoveries in the early 2000s. Four moon discoveries were announced at once in 2002: Laomedeia, Halimede, Sao and Neso. These moons are so small and distant that little is known about them besides their orbits. Most probably were formed after collisions from stray rocks in the vicinity. The team that found them used the 4-meter Blanco telescope at the Cerro Tololo Inter-American Observatory in Chile, and the 3.6-meter Canada-France-Hawaii Telescope. Psamathe was found just a year later using the 8.3-meter Subaru reflector at the Mauna Kea Observatory. Neso's and Psamathe's orbits are somewhat similar, but not much more is known about the moon besides that. The last moon found to date has been discovered so recently that no official name is assigned to it. Designated S/2004 N 1 for now, astronomers found the moon in 2013 through analyzing old Hubble Space Telescope images. It's just 12 miles (19 kilometers) in diameter. Further close-up observations of Neptune's moons will likely require another spacecraft, but as of mid-2016 none have been approved by NASA or the European Space Agency. Over the years, several working groups have proposed different ideas for getting to Neptune, but the mission concepts have yet to leave the drawing board due to reported budgetary or plutonium shortages (as plutonium is required to get a powered spacecraft out that far). As of 2015, however, NASA said it is considering looking at a Uranus or Neptune missionas a possible near-future “flagship” mission. Such a mission, however, likely wouldn't get to Neptune until the 2030s, or about 50 years after Voyager flew past. Fourteen moons orbit Neptune, including backwards-orbiting Triton. See surprising facts about Neptune's moons in this SPACE.com infographic.